The UUAWOL ministries aspires to enhance the UU covenant to affirm and promote its seven principles. We are working on the principles one at a time and considering how to affirm and promote them by enhancing knowledge, skills, and values so as to enhance our individual holiness and sanctify the world. Below is the skill component of the first principle - the inherent worth and dignity of every person. Implementing the first principle through skill training takes actions. To implement this principle in action you are being asked to extend yourself to the other. Here are some ideas: visit a temple, synagogue, stake, church of a denomination or religion that you are unfamiliar with. Meet the people and ask about their religious practices. Write a brief report or tell someone about the differences you learned about between your own people and other, and the things that are held in common. Another idea would be to visit an ethnic festival in your area of a nationality or ethnicity you are not familiar with. Notice the difference in language, music, art, clothing, food, manners and etiquette, religion, family life, etc. Tell someone about your experience, preferably back at church. At the very least you can read a novel, watch a movie, visit a restaurant that is different from your own upbringing and culture. Report what you have learned. 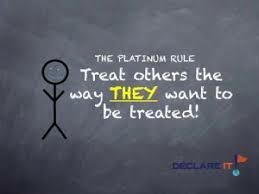 We all are familiar with the Golden rule, but consider and enact the Platinum rule which is “Do under to others as they would have you do unto them.” To enact the Platinum rule it is presumed that you understand the preferences of the other. The purpose of this skill training is to enhance the common bonds of humanity. Every person, no matter how foreign or different, has inherent worth and dignity. Overcoming our fears of the different and unfamiliar is the key to this first principle. It is scary and challenging but the benefits for our journey to holiness and the sanctification of the world are enormous. I like it. What if every UU church had its emissaries that did just this and reported back? Make for some interesting sermons or presentations.